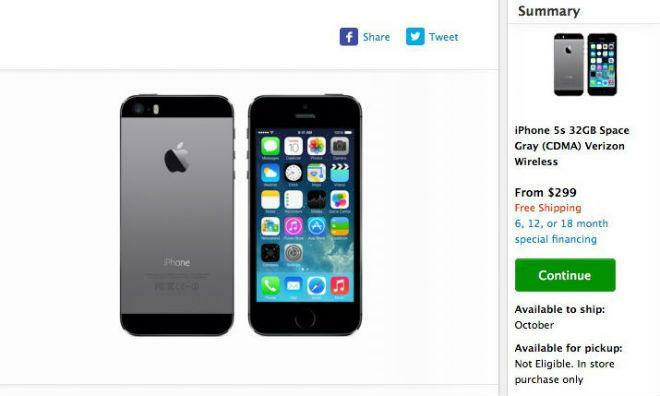 Likely indicating still steady demand for the iPhone 5s, Apple has removed pick-up-in-store availability for its high-end smartphone after just one day. On Monday, both the iPhone 5s and the iPhone 5c became available for customers to order online and pick up at their local Apple Store, sometimes in as little as one hour. Now, though, a check of Apple's online store reveals that the iPhone 5s is unavailable for in-store pickup in any color or configuration. The iPhone 5c, however, is still available for pickup in an Apple Store. Some reports have noted that the faster selling pace for the higher-end iPhone may be due largely to the rush of early adopters eager to have Apple's latest and greatest smartphone model. Demand for the iPhone 5s has been particularly high, with initial supply exhausted in less than two days. Soon after the device launched, units ordered online went from shipping in days to shipping at an unspecified time in October. Apple released figures on Monday revealing that it had sold nine million total iPhone 5s and 5c units in the devices' first three days of availability. The Cupertino company could likely have sold more of its high-end device had there been greater supply available, but Apple's 5s inventory is believed by many to have been lower than usual due to poor production yields of the built-in Touch ID biometric sensor.